I detect a growing sense of anticipation for the upcoming Nobel Prize festivities, which are just a month away. If you're not already anticipating it, you should get on that, because it's always one of the glitziest and best dressed occasions in the Swedish royal year. I have a couple posts to help you out with all your related anticipatory needs, and there's no time like the present to get started. Maternity Nobel style been more relevant than it is right now, thanks to the current Swedish royal baby boom. Back in 2011, Crown Princess Victoria piled on the sparkles in a Pär Engsheden gown while expecting Princess Estelle. Her deep blue sequined waterfall of a dress was an undoubted sartorial highlight of her first pregnancy. It was also a highlight of her growing use of the family jewel collection. Her blue gown was made to complement pieces of the Leuchtenberg Sapphire Parure, one of the sets of jewels that Queen Silvia usually keeps reserved for her own use. Victoria did not wear the tiara, but she started slow with the earrings, brooch, and hairpins, and paired them with the Six Button Tiara. 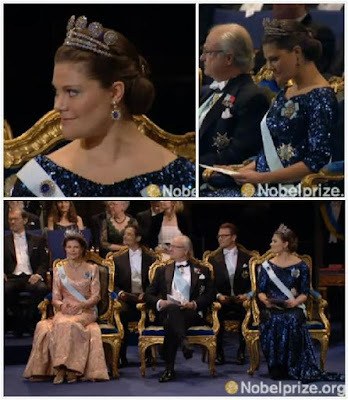 Each year since the sapphires, the Nobel celebrations have seen Victoria wear something new to her from the Swedish vaults. No new tiaras so far, but other stuff aplenty: emeralds in 2012, additional pieces of the Cameo parure at the King's Dinner in 2013, and the large diamond cross necklace in 2014. Obviously my fingers and toes are crossed that this continues, because new things on new people is always my biggest wish for everything, always.